Rango is the story of a pet chameleon who accidentally ends up in the desert within the town called Dirt. A desolate and lawless town that is in dire need of water and a new sheriff. 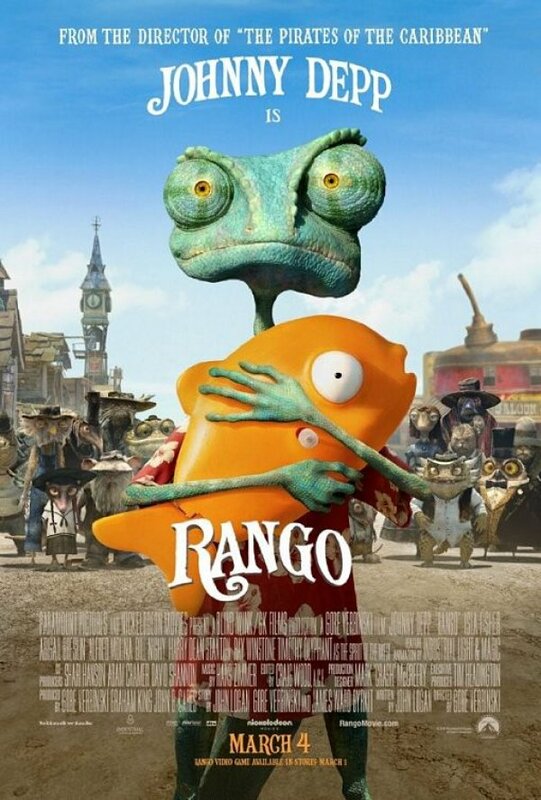 "Rango" isn't your traditional kids cartoon adventure. That isn't to say it isn't for kids or that kids won't get or like it because they'll understand and like it just fine, however it is a bit abstract in moments and tries just a little too hard at being different. At the same time it is a very simple story that moves along without too many hiccups and should not confuse the likes of anyone. The movie is at its basis about finding yourself. Now to older audiences this message should resonate more fluidly than with a younger crowd. The younger audience members will take the plot developments and interesting characters at face value while teens on through to adults are sure to see a bit more depth in the western themed cartoon from the director of "Pirates of the Caribbean and the Curse of the Black Pearl." As for the western theme, "Rango" pays great homage to the genre of film with its music and physical cues. Most of the younger audience members are probably not going to see them upon initial viewing because they would not know what it is referencing, but it may lure them into seeing further western films or when they do finally see some of the classic westerns from cinemas history, they'll remember back to when "Rango" did something similar. For fans of the western genre of film, you are in for a treat. "Rango" does a fabulous job of transplanting all of the traditional western themes into a cgi cartoon about desert creatures trying to hold on to the past and one self-aware chameleon who is accidentally there to help them. The characters in "Rango" are pretty amazing. We have a rag-tag group of unappealing desert animals that Industrial Light and Magic's animators along with Nickelodeon and director Gore Verbinski were able to make connectible (even for younger audiences). Being desert rats, rabbits, frogs, toads, tortoises, lizards and moles they aren't the most attractive looking creatures, however they are a sight to behold on screen. The details and weathered faces the animators were able to give them wonderfully reflect the story and western theme. Oddly enough I found some of the most pungent looking faces become quite adorable by the end. The voice cast of "Rango" is pretty fabulous. You have a solid cast of actors behind the animated characters and nearly everyone is invisible in their roles. I'm certain even kids won't recognize Johnny Depp's voice if they did not know going in he's in the movie. I was able to catch a couple of voices like Bill Nighy as Rattlesnake Jake, Alfred Molina as Roadkill and Ned Beatty as the Mayor but I highly doubt the average movie goer is going to be taken out of the film wondering if Balthazar really is Harry Dean Stanton or not. The ironic part is the most iconic and recognizable voice in the film isn't even who you'd think it is, instead we have Timothy Olyphant impersonating a true icon (and doing a damn fine job). What I loved the most in "Rango" is the western backdrop. The animators did a phenomenal job of capturing America's west. Not just the themes but the locations and color schemes. It is not called the painted desert for nothing and here we see breathtaking examples of that. We also feel the dryness of the film. One pivotal part to the story is water and the cartoon does a marvelous job have making the viewer dreadfully thirsty throughout. Every drop of water in the movie becomes a focal point of fixation that will certainly have you reaching for whatever beverage you brought with you into the movie. The animators also deserve heaps of credit for the depth created. For a film that is not in 3D it sure does an astonishing job of creating the perception of looking through a window. Granted nothing here feels like it is coming at you, but instead its like peering through a window into a whole new world. When I go into an animated feature I want to believe the world I'm subjected to, here in "Rango" a few aspects that are utilized to make the film feel like a western ended up taking me out of the movie even if for a brief moment. For instances the town of dirt. Most of the town looks as if it was built by the inhabitants but then their is a mail box being used for the Post Office. Now this is a cute idea, a mail box is a perfect size for rats and toads to utilize but something that made me say wait a minute, why is that there? Also the bottles the townsfolk all own. Where did they get these bottles? Who made the miniature glass bottles for water consumption? Did the ghost town have a glass bower? The weaponry throughout is also scaled down for the vermin, amphibian and reptiles of Dirt and while it fits the western aesthetic on screen it took me out of the film and made me think more than I should in a cartoon adventure. Who made these guns? Where did they get the supplies? The character Beans, who is a lizard, had curly hair to make her look like a girl. Why? All of the other animals were matched with their natural makeup, but the lizard for some reason seemed to be wearing a wig. Last gripe would be Rattlesnake Jake. His rattle is a gun. Obviously snakes do not have hands so giving a snake gun to hold is even more impossible, but I was very taken back by his barrel tail that fired off bullets as well as rattled. Who made that? Or more importantly why? Its a venomous snake why give it further advantages? All of these things are items you have to end up allowing to just happen and not question them but the fact that I even did question them bothered me albeit just a little. 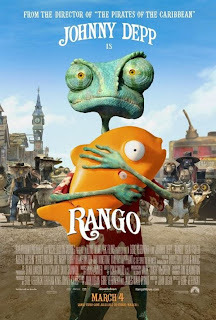 Overall "Rango" is a solid adventure for the whole family. The adults and older kids will serve to get more out of it but younger kids should also learn a simple lesson. It is an animated film that deserves talking about afterwards as well. So many animated features I see with my family and we walk away un-effected. We quickly move on with our lives, here Verbinski has given enough substance that parents can use the movie and its tale as a easy jumping point to talk with their children about who we are as individuals not to mention doing the right thing by our friends and family.